Officially known as The Democratic Republic of Timor-Leste, East Timor is a maritime republic with a turbulent history. 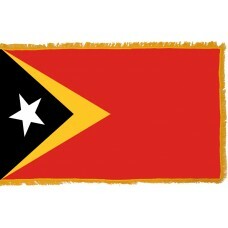 The East Timor Flag was adopted in 2002. Its flag is mainly red, which represents the ongoing struggle for independence. To the left, or hoist side, there are two triangles with a white star in the middle. The larger triangle is colored yellow, and the smaller black. The yellow color symbolizes colonialism in the countries past, while the black represents a dark past that the country is working to overcome. Together, the triangles form an arrow pointing forward. The flag's star is colored white to symbolize peace and is included on the flag as a symbol that is meant to guide the people of East Timor towards a brighter future. This one-star motif is used in other countries' flags, including that of Cuba and represents independence. In the case of East Timor, it is contrasted by a black background. Sailors from Portugal landed in the country in 1515. In 1556 The Portuguese government set Dominican monks to colonize the country and from that point, East Timor was a Portuguese colony until 1975. East Timor consists mainly of the eastern part of the island of Timor. This is a large island between Australia and the Asian continent, and is part of Maritime South-east Asia. There are thousands of islands in the region that lies between India and China. East Timor and the island of Timor lie amidst some of the most valuable sea trading routes in the world. Islands on these routes were colonized for hundreds of years by Holland, Portugal, Spain, and Great Britain. The western part of Timor is a former Dutch colony which is now called Indonesian West Timor. The nation of Indonesia surrounds East Timor. Indonesia invaded the country in 1975, which led to a conflict lasting until 1999. The country is heavily forested, which helped its nationalist forces in their fight against the Indonesian invasion. These forests are largely made up of sandalwood trees, which are highly valuable. It was this wood which first attracted colonizers from the western European powers. Despite laws designed to protect the forests, aggressive logging in recent years has caused the sandalwood forests to largely disappear. The disappearance of the country's forests has led to other major environmental effects. Despite this, East Timor is still home to some amazing scenery. The country is very mountainous, with Guatamala the highest peak. These mountains attract adventure tourists from around the world. It has very pronounced wet and dry seasons throughout the year, as it is in the tropical zone. These are part of the dramatic contrasts in East Timor which make it a fascinating country. Free land, free people, no, no to exploitation.